Worcestershire-based hop grower S J Adams & Son has been named the overall winner of the British Hop Awards for 2014, as the results of the 71st Institute of Brewing & Distilling’s (IBD) annual competition were announced at an awards ceremony in London on Jan. 23.
rounded complexity encompassing delicate floral and citrus overtones with slightly spicy and earthy notes in the background. L-R: Winner of the British Hop Award 2014 Jonathan Adams of S J Adams & Son receives his award from James Arkell, Master of the Worshipful Company of Brewers. 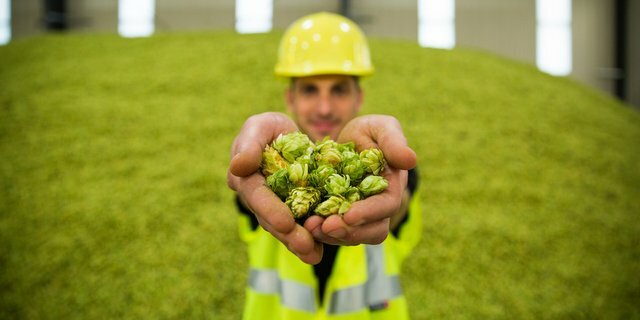 of aroma and trueness to variety type – before giving the top awards to the hops they would most want to use in brewing their own beers. Overall aroma of Goldings hops was exceptional, making this class one of the hardest to judge. Target is becoming more purposeful as a dual purpose hop for brewers, presenting some excellent aroma properties this year. It was enjoyable to see some of the new innovative aromatic varieties starting to enter the competition. Hop Merchants Cup for best sample of hops (from each category) bought on the basis of their aroma.